Our lovely flat has high ceilings, tiled floor, an expanse of living space combining kitchen, dining and lounging with little in the way of soft furnishings, the result is that every sound echoes around whether its the washing machine or the TV. And I'm sure it sounds like we're in a vast cave when we speak on the phone. For the past week or so hubby has been stuck in Bahrain whilst his passport is trying to obtain a visa for Saudi. His serviced office here has just two parking spaces and three desks but not alot else apart from dreadful traffic trying to reach to it as the location is smack bang in the middle of the Diplomatic Area. This is the main office area in Manama and parking is a premium. Around 9am it takes 5 mins to drive to the turning off the highway from home and then 30 mins or more to drop him off and extricate the car again due to the car park queues, double parking and people just stopping outside where they need to run their errand. Mostly his colleagues are away working in other Gulf States so the only reason to go to the office is if a printer or courier service is needed. Why am I telling you all this? Well the net result of small, empty office and heavy traffic is that he has decided to Work-From-Home (WFH). I've no problem with the principle as he's used to it and works diligently with little distraction. The issue is that without a study, the dining table has become the desk meaning that living area echoes with techie conversations about connecting servers all day long! And the post phone call analysis is conducted with me not that I can add anything meaningful beyond nodding. My peaceful afternoon read or slob-TV viewing goes by the wayside and I'm frequently being told that "I have to make a call", meaning “can I turn off the…” music, internet radio, TV etc. I'm looking forward to that Saudi visa or my trip sailing the Indian Ocean whichever comes first! As Ratty so famously said there is nothing half so much worth doing as simply messing about in boats and with a fair and following wind we will shortly have a little boat of our own here. Mole's said of Ratty's neat little boat "It was painted blue outside and white within, and was just the size for two animals" which fits our potential new craft quite well except ours has a mast and sails rather than oars. It’s all been a bit serendipitous. A week or so ago as I mentioned in an earlier post hubby met a man in the YC car park who knew someone selling a boat, in fact the boat had once been his. However we realised that we couldn't easily fund a boat and help our daughter & son-in-law raise the deposit they need for their new home in South Africa. The cash flow situation could according to the Micawber Principle, be "result misery". Then the phone rang; not only has our Molesey house been rented out but the first year's rent will be paid up front! Problem solved. This weekend we took a look and it fits the bill perfectly with a good record in club racing, easy to maintain and berths for weekend cruising. It's not new or smart or high tech just a 22 footer (6.7mt) looking for some TLC and the price is within our budget. The boat itself was built in the UK some 30 or 40 years ago. For the yachties amongst you it's a Galion 22 with a suite of sails including 3 head sails, a cruising chute and spinnie. 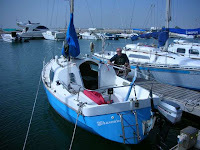 It draws 1m which is about the maximum you need for shallow seas around Bahrain. There's a small stove for brewing tea and even a head (that’s sailor-speak for a loo) although its not been used in current memory. Oh and she is called "Shawa'al" which is the month after Ramadan.